Many sincere Christians operate under the false assurance that all popular church doctrines have been tried, verified, and are therefore set in concrete. Most Christians have not performed an objective examination of the Trinity under the sterile environment of “sola scriptura.” Godʼs Word alone is (or should be) the final authority for faith and practice (2 Timothy 3:16-17). Just because we believe that something is true, doesn’t make it true. That is, unless we are never deceived. Have you ever been wrong? Some Christians have taken “about faces” on doctrinal positions they were formerly 100% committed to (I am one of these). A wise man wrote: “17 The one who states his case first seems right, until the other comes and examines him” (Proverbs 18:17). If you cannot biblically refute the Biblical Unitarian belief of who Jesus is in relation to His Father, how do you know if the doctrine of the Trinity is true? Stated another way, if you are right about the trinity, and I am wrong, you should be able to read this page and refute it “line by line.” Please do, (if applicable) based on an exegetical interpretation of Scripture. In Acts 16, the Christians from Berea were commended because they verified what they heard by “examining the Scriptures daily” (Acts 17:11). The standard used by the Bereans to “fact check” church doctrine was not church tradition, denominational compliance, a doctrinal statement, faith in oneʼs pastor, etc., but was based solely on the Word of God. Run from anyone who validates church doctrine with church tradition. The Reformation occurred because of an unwavering commitment to the Bible over the Roman Catholic Church. The Reformation is still alive for those who believe the words of Jesus, “… If you abide in my word, you are truly my disciples, 32 and you will know the truth, and the truth will set you free” (John 8:31b-32). Some quotes from Trinitarians to follow, shockingly admit that the doctrine of the Trinity is not found once in the Bible. For your information (FYI), most of these quotes were taken out of the excellent book, Divine Truth Or Human Tradition? (Patric Novas, 2006). “The trinity of God is defined by the church as the belief that in God are three persons who subsist in one nature [or, ‘being’]. The belief as so defined was only reached in the 4th and 5th centuries AD and hence is not explicitly and formally a biblical belief…The Trinitarian definitions arose as the result of long controversies..” (John L. McKenzie, S. J., Dictionary of the Bible (New York: Macmillan, 1995). Pp. 899-900). “The doctrine of the Trinity (or triunity of God) refers to the one being of God as Father, Son and Holy Spirit. The concept as such is nowhere explicitly expressed in the scriptures, though such passages as Matthew 28:19 and II Corinthians 13:14 are suggestive. The doctrine itself was thus formulated in the Church, as the community sought to explicate the meaning of the revelation in Jesus Christ.” (A Handbook of Christian Theology, Definition Essay on Concepts and Movements of thought in Contemporary Protestantism (New York: World Publishing, 1958), p. 366). “[The Trinity] presents what seems on the surface to be a self-contradictory doctrine. Furthermore, this doctrine is not overtly or explicitly stated in Scripture…Since the Trinity is not explicitly taught in Scripture, we will have to put together complementary themes, draw inferences from biblical teachings, and decide on a particular type of conceptual vehicle to express our understanding. It will be important to note the type of witness in the Scripture which led the church to formulate and propound this strange doctrine.” (Erickson, Christian Theology, Volume 1 (Grand Rapids: Baker 1983), pp. 321-322). “The New Testament does not contain the developed doctrine of the Trinity. ‘The Bible lacks the express declaration that the Father, the Son, and the Holy Spirit are of equal essence and therefore in an equal sense God himself. The other express declarations are also lacking, that God is God thus and only thus, i.e., as the Father, the Son, and the Holy Spirit. These two express declarations, which go beyond the witness of the Bible, are the twofold content of the Church Doctrine of the Trinity.’. [The Bible] also lacks such terms as trinity (Lat. trinitas which was coined by Tertullian, Against Praxeas, 3; 11; 12 etc.) and homoousios which featured in the Creed of Nicea (325) to denote that Christ was of the same substance as the Father.” (New International Dictionary of New Testament Theology, Vol 2, p. 84). To save time, this critical examination will begin at the introduction, jump to the conclusion of the article, and end at Matthew 28:19. No biblical evidence is provided. If “the doctrine of the Trinity is foundational to the Christian faith,” shouldn’t the Bible say so? One’s authority for faith and practice should be God’s Word. The belief in the doctrine of the trinity to include that those who don’t believe it are heretics is steeped deep in Roman Catholic church tradition. When Jesus walked among men 2000 years ago, man-made traditions had been incorporated into the Mosaic Law to the point that it was the law. Jesus didn’t have anything good to say about these traditions (Mark 7:6-9). If God is “one and three,” the Bible must state this. A common trait within Trinitarian apologetics (such as this one) is the absence of exegetical proof texts and misuse of the Bible. The statement that it’s possible to “come to a solid grasp of what it means for God to be three in one” is misleading. 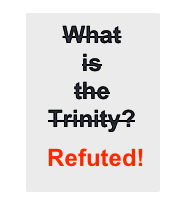 This is because no Trinitarian has been able to logically understand the doctrine of the Trinity. This article wrongly indicates that “it is possible to answer questions like these and come to a solid grasp of what it means for God to be three in one.” No human being has been able to intellectually articulate how there is only one God, who exists simultaneously as three distinct persons who are each fully God; yet there is only one God. While no believer can fully understand God in this life, the Trinitarian contradiction comes from believing a doctrine that is not found in the Bible. Therefore, no person is a Trinitarian from reading the Bible alone. Shouldn’t this raise a huge red flag? This Trinitarian affirmation that is taken back. Imagine you went to the Dr. for an ailment and the Dr. says you must take a pill to cure your illness, but then the Dr. tells you not to take this pill. As you walk out confused, the Dr. tells you again to take it and not to take it. This Dr. is engaged in contradictory “double talk.” This illustrates the Trinity. This doctrine of the Trinity affirms belief in one God, while also affirming belief in three Gods (Father, Son, and Holy Spirit). This belief is irreconcilable with God-given, self-evident, non-contradictory principles. God cannot be one and three. Three persons that differ (yet each is fully God) cannot be identical to one. “2. This one God exists as three Persons.” Most false doctrine includes enough kernels of truth to pass as legitimate. There are many verses that state there is only one God (absolute sense). If you are a Trinitarian, here is something shocking. All the “one God” passages in the Bible are attributed exclusively to the Father (Deuteronomy 4:35, 39; 6:4; 32:39; 2 Samuel 7:22; 2 Samuel 22:32;1 Kings 8:60; 19:15; 1 Chronicles 17:20; Nehemiah 9:6; Psalm 18:31; Isaiah 37:20; 43:10; 44:8; 45; 45:14; 45:18; 45:21; 46:9; Zechariah 14:9, etc.). In the New Testament, this truth is further affirmed by the lips of Jesus, and the writings of Paul and John, etc. (John 5:44; 17:3; Mark 10:18; 12:29; Romans 3:30; 1 Corinthians 8:4-6; Galatians 3:20). The Bible never attributes “one God” to the Son, and/or the Holy Spirit. So Trinitarians are correct that there is one God, but incorrect by transferring this singularity to all three members. In the Old Testament, the word “god” “elohim” can describe the one true God (Psalm 114:7, etc.) false gods (2 Kings 17:31, etc. ), foreign gods (Daniel 11:39), angels (Psalm 8:5, etc. ), Moses speaks as God (Exodus 4:16), a ghost (1 Samuel 28:13), etc. In the New Testament, the word “god” (“theos“) can describe the one true God almighty (Matthew 3:9, etc. ), Jesus Christ (John 20:28, etc. ), a person thought to be god (Acts 28:6), the false prophet (2 Thessalonians 2:4), a false idol (Acts 7:40, 43), human beings (John 10:34), Satan (2 Corinthians 4:4), etc. Just as there is a difference between the President of a country and a president of a local bank, the word “god” in the Bible needs be understood in light of the historical and cultural contexts when used because it applies to many persons/beings. Within the Old and New Testaments, the Jewish understanding of the word “god” was very different than our understanding today. Most today identify the words “elohim” (Hebrew) or “theos” (Greek) in its highest form to describe the title for Jehovah or God almighty. But few people in our day recognize that these same words can describe many other persons, objects, etc. Most Christians may be unaware that Moses acted as God before pharaoh. While Moses (of course) was not the one true God, he was appointed by God as His representative to deliver His message: “So the Lord said to Moses: “See, I have made you as God to Pharaoh, and Aaron your brother shall be your prophet” (Exodus 7:1; NKJV). So how can passages that teach that there is only one God be reconciled with the many passages that identify a plurality of gods? There are no biblical contradictions. The verses that identity that there is only one God, all identify the Father (none include Jesus Christ or the Holy Spirit). These verses accentuate that God the Father (Yahweh) is so great, that all other gods cannot be compared. Yahweh is in a category of greatness that only includes Himself. Image a car that is made so perfect that it became known as the “only car,” even while there were many inferior cars in existence. So is YAHWEH’s incomprehensible greatness. He is a GOD of one. Yahweh’s exclusiveness accentuates His absolute awesomeness and sovereignty as the only God (which Trinitarianism diminishes). This is why worshiping the Father as the only God is not polytheism (worshiping more than one God) but true Old Testament monotheism (worshiping one God among all others). While the Bible speaks of other gods (angels, judges, etc. ), they should be understood within biblical parameters; their existence doesn’t retract from Yahweh’s uniqueness, but complements the Father’s greatness as the only God (absolute sense). Jesus didn’t steal glory from the Father (as a Trinitarian equal), but repeatedly emphasized the Father’s superiority. Jesus said: “49 For I have not spoken on my own authority, but the Father who sent me has himself given me a commandment—what to say and what to speak” (John 12:49). If Jesus was equal to the Father, He would have spoken for Himself but never did. Jesus never spoke anything that the Father didn’t have Him speak. The submission of Jesus to the Father who is greater was evident in everything Jesus did. “30 I can do nothing on my own. As I hear, I judge, and my judgment is just, because I seek not my own will but the will of him who sent me” (John 5:30). Trinitarians dismiss the Fathers repeated superiority over the Son as functional but not actual. But there is no biblical support for this. The Bible presents the Father as superior because He was and continues to be. “16 So Jesus answered them, “My teaching is not mine, but his who sent me” (John 7:16). Jesus didn’t volunteer to come to earth. He was sent. The Sender is greater than the one sent. Yahweh exalted Jesus Christ to His current position (Philippians 2:9) and seated Him at the right hand of His central throne (Psalms 110:1; Mark 16:19; Matthew 26:64; Romans 8:34; Ephesians 1:20; Colossians 3:1). Jesus could not of been exalted to a position that He already possessed. Similarly, Jesus was made Lord by the “one God” (Acts 2:36; Philippians 2:11), because He previously was not Lord. Jesus said, “All authority in heaven and on earth has been given to me” (Matthew 28:18b). This means that every ounce of authority came from His Father. Speaking of “Father,” Jesus has a Father (Romans 15:6; 2 Corinthians 1:3, 11:31; Colossians 1:3; Ephesians 1:3; 1 Peter 1:3.) but God the Father has no Father. Jesus has a God (John 20:17; Romans 15:6; 2 Corinthians 1:3, 11:31; 1 Peter 1:3; Revelation 1:6, 3:12), but Yahweh has no God, for He is GOD (absolute sense). Jesus worshipped the Father (John 4:22; Mark 14:26; Hebrews 2:12. ), the Father God almighty worships no one, He is the only God. Jesus said the Father is greater (John 10:29, 14:28), because there is no one greater than the Father. The book, Divine Truth or Human Tradition (Patrick Nova, 2006), explains this topic well: “Although it is true that Jehovah declared that he is the only God, the most outstanding point to keep in mind is that it was Jehovah himself who designated the ancient rulers of Israel with the honorific title ‘gods.’ Yet this never represented a contradiction, nor did it somehow imply that these ‘gods’ must have been ‘of the same essence’ or ‘being’ as God; neither did the Bible writers intend for them to be thought of as ‘false gods.’ They were properly called gods because they had authority delegated to them by the Almighty God. That is why we benefit from remembering, as the Psalmist declared, ‘Jehovah is a great King over all other gods.’ 17 He is ‘the God of gods.’ 18 That is why the angels are commanded to worship Jehovah: ‘Worship him all ye gods…For thou, Jehovah art the Most High above all the earth; thou art exalted above all gods‘” (239). Jesus also believed that the Father was the only God. “3 And this is eternal life, that they know you, the only true God, and Jesus Christ whom you have sent” (John 17:3). Because of the Father’s incomprehensible greatness, Jesus calls Him, “the only true God.” This is consistent with other verses where Jesus identifies His Father as being the “one”, or “only God.” Here are other verses for your research: John 5:44, Mark 10:18, Mark 12:29-34. So point #2 (“This one God exists as three Persons.”) is false. The number “one” in the Bible never, ever means the number “three.” God is not the architect of fuzzy numbers. The Father is the only God (absolute sense). While Jesus is called called “God” in some passages, this usage is consistent with the range of meaning encapsulated within the word “god.” The most expensive car in the world and an economy car —while different, they are both cars. The word “god” needs to be understood within historical biblical parameters. If Trinitarians were consistent (Jesus is called God, therefore equal to the Father), they would have to make all good and evil god’s equal to the Father. But they don’t because they recognize the range of meaning for the word “god,” but make an exception for Jesus and the Holy Spirit. In Biblical interpretation, we should be consistent with rules. Switching goal posts as necessary to preserve the man-made doctrine of the Trinity is hypocritical. First, there is no godhead in the Bible. Secondly, while most of this summary is correct, the statement, “there have always been and always will be three distinct persons in the godhead,” contains error. While the Father and Son are very distinct persons, the Holy Spirit should not be understood as a separate person apart from God. While it’s more important who Jesus is in relation to His Father, some coverage of the identity of the Holy Spirit will be made. Because the Bible identities the Holy Spirit simply as God’s Spirit (not a separate being) in many passages, this is one of the elements of the Trinity that God used to cause me to doubt the doctrine of the Trinity. We don’t have to go farther than the second verse of the Bible to find a problem with the Trinitarian view of the Holy Spirit. The Trinity teaches that the Holy Spirit is a separate person, apart from God (not God’s Spirit). But the Bible disagrees: “The earth was without form and void, and darkness was over the face of the deep. And the Spirit of God was hovering over the face of the waters” (Genesis 1:2). The phrase, “Spirit of God” denotes that the Spirit is God’s Spirit. Similarly, the “car of John” means that the car belongs to John. Human beings are made in the image of God. Human beings also have a Spirit (1 Corinthians 2:11; Job 32:8, Ecclesiastes 12:7, Proverbs 20:27, Romans 8:16, etc.). Would not Jesus also have a Spirit? He does (Romans 8:9; 1 Peter 1:11). In biblical interpretation, we should guard against poisoning the pure Word of God with presuppositions. The quote above is designed to convince readers that the Holy Spirit is a separate person apart from God. But none of the verses provided establish this thesis. Just because the Spirit of God “reasons,” “thinks,” “understands,” “feels,” and “gives personal fellowship,” doesn’t rule out God’s own Spirit at work. None of these verses teach that the Holy Spirit is not God’s Spirit or is a separate person. The statement that limit’s God’s Spirit to being unable to act as “an impersonal force (like gravity)“ demonstrates how the trinity limits God’s powerful Spirit. The identification of the Holy Spirit (within Trinitarianism) is defined by the Trinity (eisegesis). But the Bible should define who God and His Spirit are. “10 these things God has revealed to us through the Spirit. For the Spirit searches everything, even the depths of God. 11 For who knows a person’s thoughts except the spirit of that person, which is in him? So also no one comprehends the thoughts of God except the Spirit of God” (1 Corinthians 2:10-11). “11 All these are empowered by one and the same Spirit, who apportions to each one individually as he wills” (1 Corinthians 12:11). Yes, the Spirit is the one who “apportions to each one individually as he wills.” But this Spirit is God’s Spirit. A few verses earlier in the passage we have the source for this spirit: “4 Now there are varieties of gifts, but the same Spirit; 5 and there are varieties of service, but the same Lord; 6 and there are varieties of activities, but it is the same God who empowers them all in everyone” (1 Corinthians 12:4-6). This provided verse disproves the Trinitarian dogma that the Holy Spirit is a separate person apart from God: “30 And do not grieve the Holy Spirit of God, by whom you were sealed for the day of redemption” (Ephesians 4:30). Here is the last verse they provide: “14 The grace of the Lord Jesus Christ and the love of God and the fellowship of the Holy Spirit be with you all” (2 Corinthians 13:14). This verse lists the Holy Spirit separate. But this doesn’t prove that the Holy Spirit is a separate person apart from God. Each human being is born with a spirit. Each human spirit is not a separate person apart from who we are. God’s Spirit operates supernaturally within us. But God’s Spirit should not be divorced from God. The fact that the Holy Spirit speaks, reasons, wills, etc. is not in itself proof that the Holy Spirit is a separate being apart from the Father. God is a Spirit and His presence is with every believer: “Or do you not know that your body is a temple of the Holy Spirit within you, whom you have from God? You are not your own, 20 for you were bought with a price. So glorify God in your body” (1 Corinthians 6:19-20). Here is another quote provided inside the book, Divine Truth or Human Tradition? : “The fact that the Spirit is sometimes depicted as ‘teaching, ‘speaking,’ ‘interceding,’ ‘guiding,’ and ‘helping’ in the Scriptures has influenced many theologians to conclude that the Spirit must be a distinct person like God the Father and Jesus Christ. But because the Spirit does not have a personal/proper name like the Father and Son, is never shown to be an object of worship or recipient of prayer, and never depicted or identified as a member of a ‘triune’ God in Scripture, other Bible students believe that these are simply a few out of many examples where Scripture uses the common linguistic device of personification—that is, the practice of ascribing personal attributes, qualities, or characteristics, to subjects that are not actually or literally persons. This method of communication appears all throughout the Scriptures. C. F. D. Moule observed: ‘When the Spirit is the mode of God’s presence in the hearts and minds of his people, then there is a good case for personal language. But this still does not force upon us a third eternal ‘Person’ (in the technical sense) within the Unity [of God].” (Moule, The Holy Spirit, 1997, p. 50); (Navas, 509-510). Just because something is stated to not be a contradiction doesn’t guarantee it isn’t. To get out of the contradiction that exists in the Trinity (God is three, while being one), Perman states that “God is one in essence, three in Person.” The problem is that he is not being forthcoming. The Trinity teaches that all three are equal in essence, so when Perman omits “essence” for the three persons and only applies it to the triune God, he is not being transparent. For example, Perman writes, “The divine essence is not something that is divided between the three persons, but is fully in all three persons without being divided into ‘parts’” (emphasis mine). Again, Perman assigns equal essence to the three Trinitarian members: “the being of each Person is equal to the whole being of God.” So all share the same essence. So please don’t be deceived by those who state the Trinity is not contradictory. Thankfully, some Trinitarians are honest and admit that this doctrine is incomprehensible. Element of the Trinity: Element Present? Because this verse offers no proof of a Trinity, the author resorts to front loading presuppositions. When the Bible is interpreted through the eyes of assumptions that are held as established facts, the Bible confirms the presuppositions applied. I know well, I was blinded by Trinitarianism. Let’s analyze some theological loaded baggage that is not found in the text. “In fact, would Jesus have us baptize in the name of a mere creature?” Apparently, because most Biblical Unitarians (BU) are Jehovah Witnesses (they don’t call themselves BU’s), the writer attacks JW’s with a twisted mischaracterization. Because JW’s believe that Jesus Christ formerly existed as an angel before he took on human flesh (He no longer is an angel and was exalted to Lord), many in sincerity attack JW’s by wrongly claiming (or implying) they teach that Jesus is a “mere creature.” I have never seen any JW literature online that makes this claim or found evidence of this on their website. While I am not a JW and strongly disagree with some of their doctrines, I have found that most charges levied against them are false or twisted (contains some truth). Because the statement, “would Jesus have us baptize in the name of a mere creature?” is speculation outside of exegetics, this review will move on. “Therefore each of the Persons into whose name we are to be baptized must be deity.” This is speculation or can be truth depending on the definition of “deity.” If the definition of deity includes the range of meaning for the word based on dictionaries (any god, good or evil is deity), then each person (Father, Son, and Holy Spirit) is property called “God” without implying they are equal. Two different cars are “cars,” even if one car is expensive car and the other is not. If the word “deity” is understood based on the Trinitarian definition of deity (all three contain the same essence, the three are one God, etc.) it is not stated in this verse and is speculation. “Third, notice that although the three divine Persons are distinct, we are baptized into their name (singular), not names (plural).” The word “name” here in Greek is singular (not “names”). So all three are baptized into the singular name. But please notice that while “name” is singular, they are baptized into the name of three nouns (Father, Son, and Holy Spirit), which is plural. Some Trinitarians substitute the word “name” for the word “God” to form a Trinity (one God = Father, Son, and Holy Spirit). The notable book, Divine Truth or Human Tradition? says, “This is one reason why one is able to see that the assertion that the ‘name’ in Matthew 28: 19 should be taken (and was intended to be taken by Jesus) as standing for ‘the name/ essence of God’ is really a clever and creative technique of argumentation put forward to support an already-established doctrinal concept without a basis in the actual text. Naturally, such crafty and such shrewd though clearly erroneous methods of argumentation could only contribute to further, justified skepticism with respect to the scriptural foundation of Trinitarian teaching” (page 50). What does all this mean? In biblical interpretation, we are not looking for some deep, below the surface meaning that is not plain and obvious. Trinitarians import more into this verse than is plainly, explicitly stated. As believers in Jesus Christ, our commission is to carry out the Great Commission by making disciples. Within this process is the important NT ordinance of water baptism. Baptism should be performed in the singular name of Father, Son, & Holy Spirit. In closing, please know that the sharp tone of disagreement with some statements made by the author of this article (Matt Perman), are not to question his sincerity, faith, commitment to Christ, etc. The disagreement is theological. While I have never met him, I expect he is a committed Christian who loves Jesus Christ. I believe there are many godly Christians who are Trinitarians. Every Christian will stand before Jesus Christ very soon to give an account, starting with myself. May God bless you as you follow His Son with an exegetical interpretation of God’s Word.